Supernatural horror thriller, mature content, 304 pages. A new vampire has taken over Cedarcrest Sanctum. She is NOT the last. After a woman in white is encountered along a lonely highway in Jackson County, West Virginia, an unusual number of vampires begin to turn up. Once their mysterious maker is discovered, Janiss Connelly must confront those she left behind in life before she can stop the sadistic murderer once and for all. Once again, Kevin Ranson has created unforgettable – and unforgivable – people whose power no reader can resist. Ranson’s authorial command is evident in his tightly woven plot, into which he masterfully entangles Janiss and her Cedarcrest team – and new friends and enemies. The Matriarch: Guardians is a worthy sequel to The Matriarch – and a reading experience not to be missed. Ranson truly has staked out new vampiric territory with his ongoing Cedarcrest saga. …I can see the scope for the stage to expand book on book… that is no bad thing — Ranson has nicely rounded the main character Janiss and, whilst one of the interconnections with another vampire being associated with mortals from her former life was a tad convenient, it didn’t feel unnatural. I said that the last volume kept me interested — this volume kept me glued and I devoured it…a sincere hope that the series continues to grow from strength to strength. 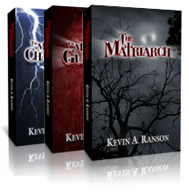 Just when you think you know what to expect from a sequel, Kevin A. Ranson completely shatters predictability with The Matriarch: Guardians. The perfect pace and continuity of the different subplots fuse together seamlessly (to) deepen the pull into each character’s motives. Although the first book The Matriarch delivered a dark and intense sojourn, the sequel has managed to launch the story out of the atmosphere! …BETTER than the original! …The reader can tell that Kevin Ranson really grew as an artist between books and the result was this…so realistically written that you may find yourself looking over your shoulder at night! …Vampire lovers have found their next favorite vamp series! Finally a novel with vampires that are interesting. They kill, but it is not just about romance — it has actual horror. …great story and some surprising plot twists. If you read the first book, this one is so much better. I am looking forward to the third book. …an awesome read. Have been looking for vampire fiction that is less romance and more action horror, and I finally found it in this book.